candidates can download the application form from the official website of APSC is www.apsc.nic.in from 08-02-2019 onwards. The candidates will be shortlisted based on the written examination and Interview for the APSC CO, CDPO Posts Recruitment 2019. The last date to send the prescribed format of the application form to the address of Deputy Secretary Assam Public Service Commission Jawahar Nagar, Khanapara, Guwahati-22, Assam on or before 06-03-2019. 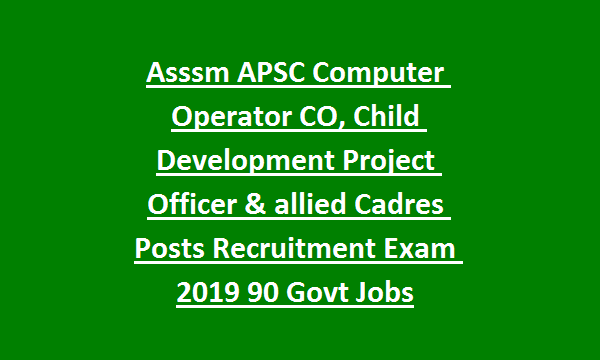 For more details of salary, application fee, Exam Pattern, and syllabus are given below for the APSC CO, CDPO Govt Jobs Recruitment Notification 2019. The application forms will be available from 08-02-2019. The last date to send the prescribed format of application form 06-03-2019. As on 01-01-2019 the age limit for the candidates apply for APSC CO Posts Recruitment 2019 is in between 18 to 44 years. The age limit for the APSC CDPO & allied Cadres posts is in between 21 to 38 years as on 01-01-2019. The upper age limit relaxation will be applicable for the OBC candidates is 03years, for SC/ST candidates is 05years and for PWD candidates is 10years. 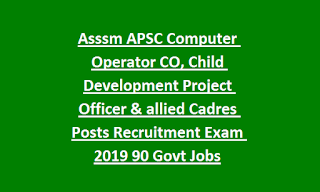 The required qualification for the APSC CO, CDPO Posts Recruitment Notification 2019 is post name wise given below. Computer Operator – class XII passed, Good working knowledge of office productivity software tools, must possess a minimum of 6 months completed diploma in computer proficiency. Child Development Project Officer & allied Cadres jobs – Graduates in Arts, Science, and Commerce/ PG Degree/Diploma in Social Works/ Graduate in Child Development/ Home Science/Nutrition/ Graduate Having Philosophy. The salary for the selected candidates will be given below. For CDPO jobs – Rs.22000 – 87000/- with GP of Rs.9700/- of PB-3 plus other allowances. The application fee for the General candidates is Rs.250/- and for SC/ST/OBC/MOBC candidates is Rs.150/-. The candidates will be recruited based on the written examination and interview. Eligible candidates can download the application form from the official website of APSC is www.apsc.nic.in from 08-02-2019 onwards. The candidates will be shortlisted based on the written examination and Interview for the APSC CO, CDPO Posts Recruitment 2019. The last date to send the prescribed format of the application form to the address of Deputy Secretary Assam Public Service Commission Jawarharnagar, Khanapara, Guwahati-22, Assam on or before 06-03-2019.